Today's hazy black-and-white set is an ugly duckling that became, at least for collectors, the beautiful swan. Many minor league collectors even consider this 1970s rarity their Mona Lisa. With an estimated 500 team sets printed (and many discarded since 1977), singles go for four figures in the current marketplace; PSA's article on Rickey notes that one team set sold for over $1300 in 2007. 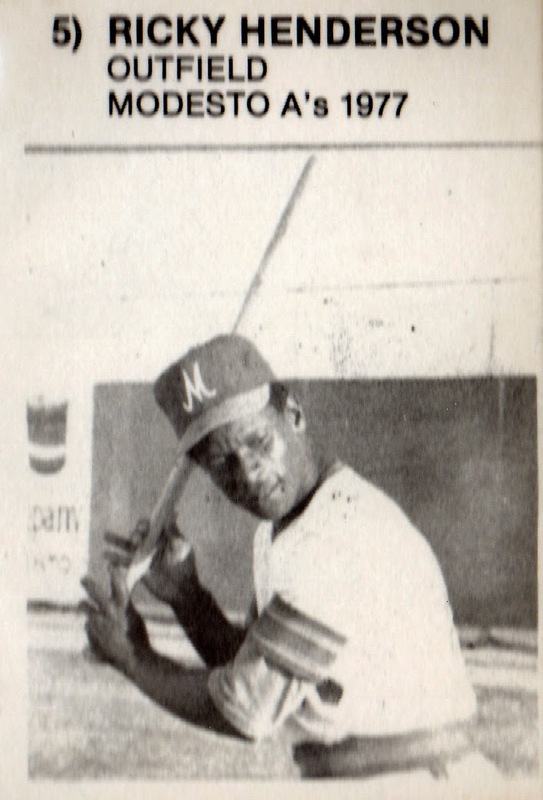 This particular image isn't well-known, but it reappeared in a 1980s "Klector's Mints" series by NYC cab driver and baseball fan Bernard Kleckner. He recolored black-and-white sports photos with chalk and printed cards for taxi customers as a way to generate repeat business. 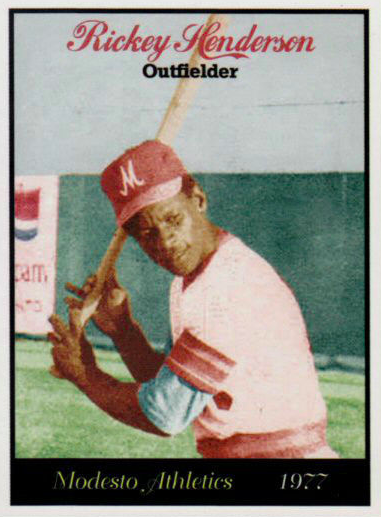 Kleckner handed out 400 of each card in his series, similar to the print run of Chong's Modesto team set, but demand and cost for the 1977 original runs far higher, the hobby being what it is. 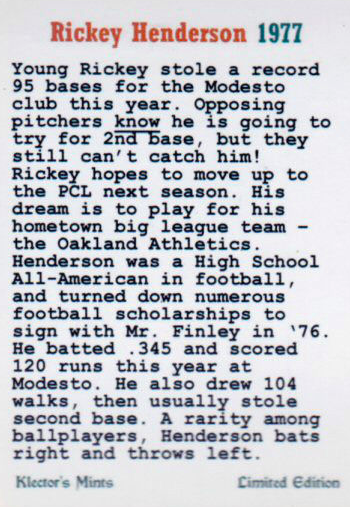 Chong printed a 22-card team set for Modesto, Oakland's affiliate in the single-A California League, and players in bold went on to appear in the majors. Fakes / reprints: As a Hall of Fame pre-rookie, Henderson's at high risk for fakery. Chong also reprinted this card (with a new border and back text) for their 1989 Modesto Alumni set, so anything that says "alumni" is from that issue. Thank you for taking the image of my card and using it without permission. For the comment of the value being unrealistic, see Cal Ripken minor league sales recently. 20k and many over 10k. Chong is just as rare and in impeccable condition. Provide a reference, but are you also providing a pricing reference from known sales of the card? PSA 7 recently sold $1500. There are very few graded higher than that. A top 3 graded copy of this card fetches a premium, as it should. I will agree that most sales for an item like this will not happen on Ebay as a completed auction. There has been a great amount of interest in this particular card, I believe Rickey is getting his respect in the hobby, some of it long overdue.